One of my customers is always finding the most beautiful designs and asking me to recreate them for her. I love it because it challenges me in all the right places. You know how when you’re good at something, sometimes you can lose that deep down satisfaction that comes from doing that thing for a minute? That happens to me sometimes, so when I get a project for something I’ve never done before, it inspires my creativity and requires me to put everything into it. This was such a fun project. It started out as a 3’ x 3’ empty wooden tray. Yep, you read that correctly … one yard by one yard! I’ll admit I was a little intimidated by that piece of wood initially. Once I started pulling everything together though, from the fresh fruit, to cheese and crackers, to cookies and brownies and cookie cups, it became a creative spirit’s dream. 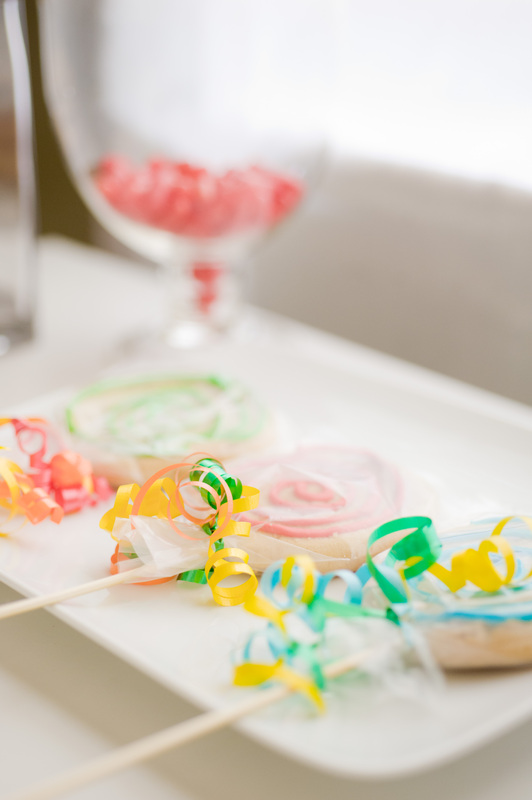 This was created for a surprise birthday party, and I think it would be so fabulous for any party. It would be an incredible centerpiece for any table, and I love how everything works together to create the most gorgeous arrangement. Do y’all remember when I bought this shop and Hailey was a tiny little two and a half year old? At three, she would put on her princess dress (we had every princess to choose from) and announce she was ready to go to work. She has literally grown up with me at the shop. 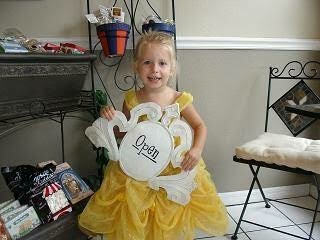 When we first started, she loved putting up the open sign and turning the lights on. Holy wow, would she give me a look if I put up the open sign before she got to it!! 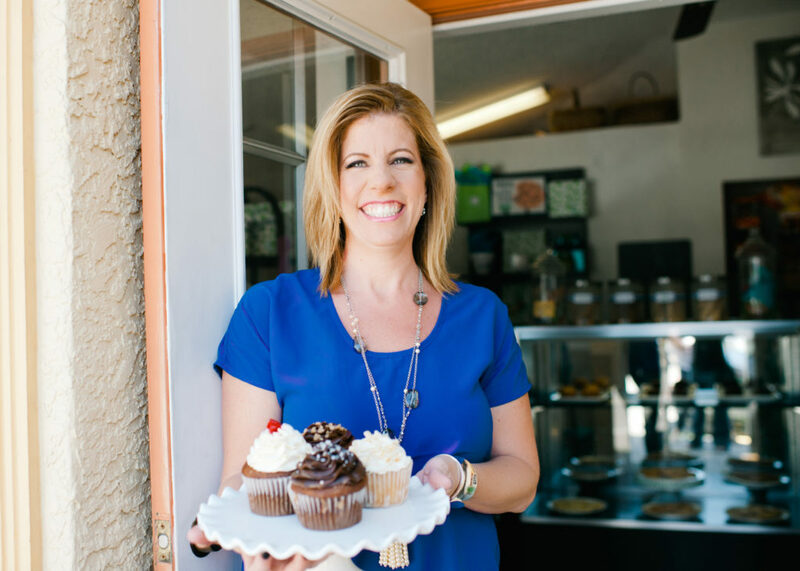 Over the years, she learned to do every job, from baking to serving customers. For years, she begged me to let her help the customers. And a lot of times she did! Every once in a while there would be a customer that didn’t want her to help them because of her age, and she would get so frustrated. We both know she could have done it just fine, but some people just aren’t comfortable with that, and that’s ok. She became my right hand girl at the festivals, keeping track of what needed to be done and making sure we were organized and on schedule. This girl is an organizing master … she loves getting everything in perfect order. Every summer, she’s been in the shop, helping in any way she could. Still pressing against those age boundaries, still wanting to be given more responsibility, still learning the ins and outs. Now she’s a teenager, so naturally she’s learning to help with responding to emails and creating social media posts. Her talents and gifts have grown with her, and it’s really been amazing to watch her. She knows what I’m thinking almost before I even finish a sentence, and she reminds me when I get busy and lose track of a timeline. This summer, though, has been her year to shine. She’s the first to greet a customer when they walk in the door, ready to offer them their selection in a cutely wrapped package, just because she, like me, loves to see their smile of appreciation. She has a routine when we get to the shop, and she executes that routine flawlessly. She’s in the kitchen baking right alongside me, and handling so many aspects of the shop with knowledge and tenacity. I see her work ethic blossoming and growing, and it makes me teary eyed with pride. When I bought this shop almost twelve years ago, I hoped that Hailey would grow to love it as I did. I loved having this thing that we shared, that was just always part of us. It brings me so much joy that many of the memories we share revolve around this business that has come so far. Last week, she got to be in charge while I ran to an appointment. I did what I think all business owners do when they leave their business in someone else’s hands for the first time. I made lists, I reviewed everything, and then did it again. I tried to think of every scenario that may come up and walk her through it. Not surprisingly, she hit it out of the park. Like I mean she really, really did great. I got texts and pictures while I was gone of all the stuff she was handing. And that was the thing. She was handling it. She DID handle it. She was so proud of herself, for good reason. I am so proud. That little princess from eleven years ago would make any woman entrepreneur stop and take notice. That’s my girl, and this is our shop. I, for one, will be eternally grateful for this time we’ve had together. I hope it defines her life just a fraction of how it has defined mine. It’s just a given in my household that I will have a tshirt to wear for every occasion. The kids make fun of me for it now, and roll their eyes, but I love them, and there’s just no going back. When I had my baby, I ordered a tshirt. When I adopted my little girl, I custom designed a tshirt. Bought a business? Accessorized it with the shirts. When I married into a blended family, I bought the shirt. Don’t forget the engagement and new wife shirts in there too. Yep, I have a few of them. Child started playing a sport? I wore it. Hubby started coaching a team? You guessed it, I found the cutest tshirt to wear to his games. I’m obsessed, I know it, and I own it. So it was only a matter of time before I started looking into designing a line of tshirts for the Kookie Krums brand. We’ve sold shirts in the past (shocker), but we’ve never done our own custom line. I don’t know why, really, I mean, how could I have missed the possibility?! But here we are, and they are just fantastic. We partnered with an awesome company out of Tennessee, Parker Grace Designs, to find the softest tshirts in the prettiest shades of color. We added our own funny quips, because aren’t the very best shirts the funny ones?! Life can always use more smiles, more laughter. We now have available, for you, our initial four designs. They are, of course, available in our shop, and are also available online. Do you have a friend who shares my love of tshirts? You can pick one out for a gift, and we’ll wrap it up in the cutest packaging, just like we do all of our gifts. Shipping is always available, so you can send it directly and have the perfect gift arrive on their doorstep. Are you a fan of tshirts? Pick out one (or four) for yourself! They really are so soft I don’t even want to take them off. The shirts fit true to size, although if you want a more fitted style, I do recommend sizing down one size. That’s what I did, and I really love the fit. 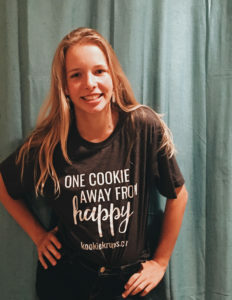 In the meantime, I’ll just be over here rocking my cookie shirts. Because what’s the point of being the Cookie Lady if you don’t have the cute tshirt to go with it?! School will be starting back in a few weeks …. can I get an amen from all the moms who are ready for summer to be done already?! Let me first just give a shout out to all the teachers. Every single one of you has my utmost respect, and I cannot even begin to find the words to express the gratitude I have for you pouring into these young lives. That’s exactly what I did. I can’t even tell you how many people have stepped in to help my daughter succeed. And that is what I remember at the start of every year. Don’t wait for Hallmark to tell you to appreciate your child’s teachers and helpers. Don’t wait for the administration to designate a week. Don’t wait for a holiday. Find the people who are pouring into your child, and appreciate them as much as you can. They will earn it. Oh, and the principal who told me that? She refers to herself as my daughter’s “school mom.” She follows her progress and recommends teachers and extra help for her. And guess what, she does all of this, and she’s not even her principal anymore. I told you she’s amazing. My little family business has grown by quite a lot! 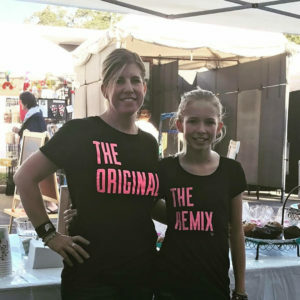 What started out as a business for me, when my daughter was two years old, first grew to a steady business that supported me as a single mom with two daughters, and has now grown into a family affair of myself, my new husband (love saying that!) and our seven – SEVEN – children! I love documenting our life, because I love to look back and see how far I’ve come . . . how far we’ve all come. When I first bought this adorable little shop, I had no idea what I was doing, except that I knew it would give me the opportunity to be creative every single day and that was my passion. 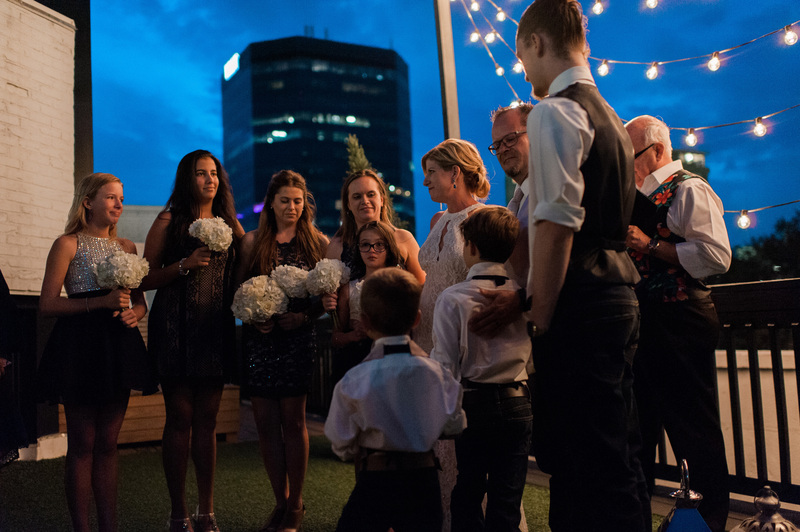 Now, eleven years later, I have so much fun sharing my stories of being a small business owner, having a great big blended melting pot of a family, and all the organized chaos that goes along with keeping everything running like a machine. I think as women we often sell ourselves short. We don’t give ourselves, or other women, the credit due for running a business, caring for a family, and taking care of a home. Many times we’re sold on the idea that we have to choose, that we can be one thing, but not all things. I was never content with that. I wasn’t content to be a stay at home mom and not work. I love to work! I give all the credit in the world to the moms who stay home with their children – they clearly were in the line getting patience while I was doing who knows what – but it just wasn’t me. I never found my niche there. Where I do feel comfortable, what is my niche, is owning my own business while being a mom and a wife. I thrive on taking care of my children, my family, and my customers (many of whom have become my chosen family). I proudly stand beside countless women who want the same, and I relish the idea that there’s plenty of room in the pool for all of us, and by lifting up each other we can all do it all together! My plan is for this little space to be my spot. If you came to visit me at my home, or at my shop, I would offer you a stool to perch on, a delicious cup of hot coffee, and probably more conversation than you bargained for, because I tend to be an over-sharer. My friends all know that one of my new year’s resolutions every single year is to be able to answer the phone and say “no, nothing new here, what’s going on with you?” But none of us really believe that will ever happen. I ALWAYS have a story to tell! So this is where I will welcome you, to come behind the counter, sit with me for a while, and hear the craziness that makes up all of my life, both business and family. 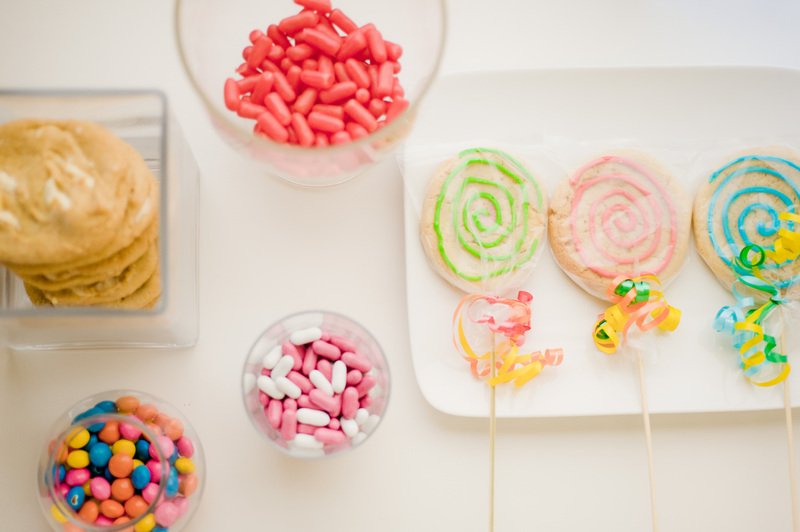 I hope you leave each time you visit with laughter, love, and plenty of sweets. I truly am so glad you are here. Delicious Teacher Gifts They Will Appreciate! Teacher Gifts . . . at the top of parent’s lists every year. We love to gift our teachers, don’t we? They do such a fantastic job teaching our little (and not so little) ones every day, and everyone agrees how over-worked and under-appreciated they are! But sometimes the pressure of figuring out WHAT to give the teacher is overwhelming! Good thing for you we’re a one-stop-shop that can take care of all the teachers on your list in a minute! Our favorite teacher gift is a cookie box. These boxes come in all kinds of holiday designs to match the personality of your child’s teacher. Whether they’re fun, classy, manly . . . we’ve got designs for everyone! 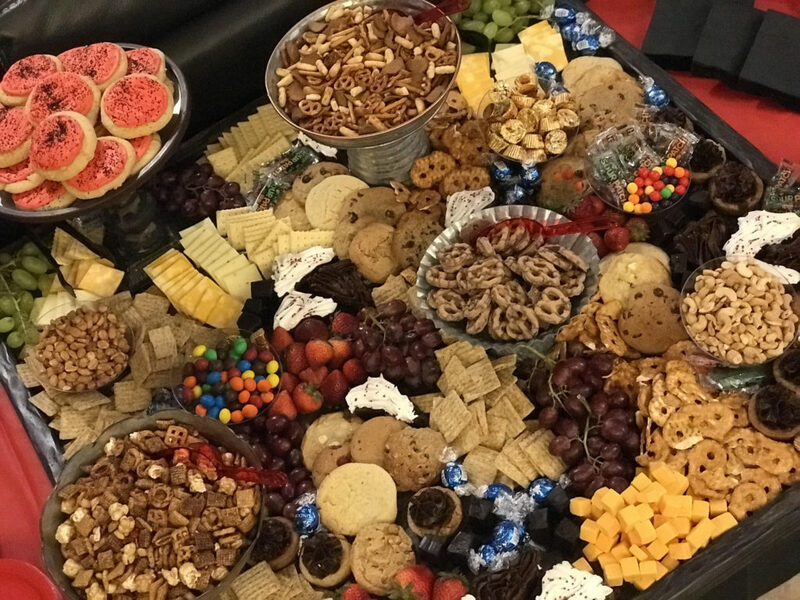 The standard option that most people choose is to fill the box with a dozen cookies. 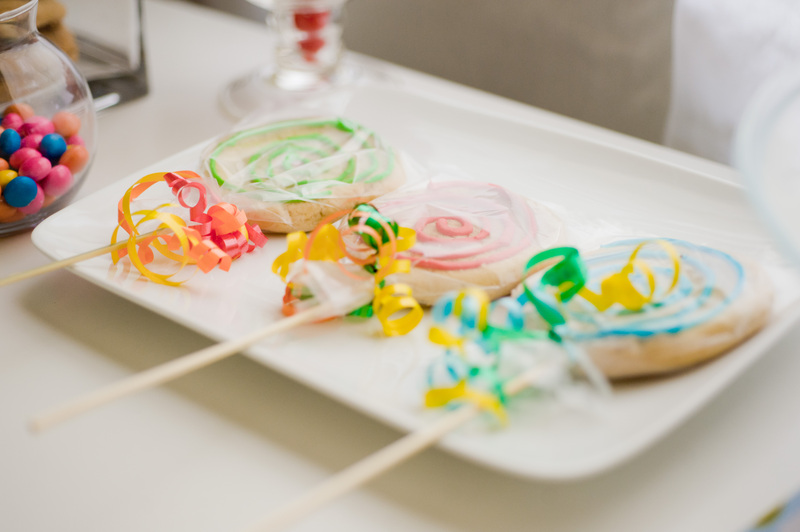 We wrap the cookies in cellophane, arrange them in the box with tissue and shred, and tie it all up in cellophane topped off with a festive bow. At only $18.95, this is a beautiful gift that makes a statement, and still comes in under the usual budget of about $20.00. If your kid’s teacher is a coffee or cocoa drinker, then our holiday mug is another great gift. You can do these one of two ways . 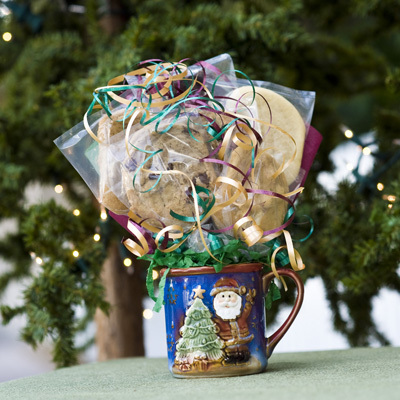 . . you can choose a cookie bouquet in a mug, with a half dozen cookies artfully arranged. Or, you can choose a mug filled with goodies – a few cookies, a packet of coffee or cocoa, and a chocolate spoon or two – YUM!! The mugs range from $14.50 to $21.95 depending on which way you want to go. This year we have some really adorable holiday plates that make such a fun gift when they’re filled with cookies. These start at $14.50 as well. We’re also stocked up on some very cute containers that teachers can use in their classroom every season! Once they devour the cookies, they’ll still have a holiday container to pull out every season and put to good use. I personally think consumable gifts are the best gifts. I mean, how many teachers do you know that are hoping for another apple ornament or another pencil wall hanging with their name on it? 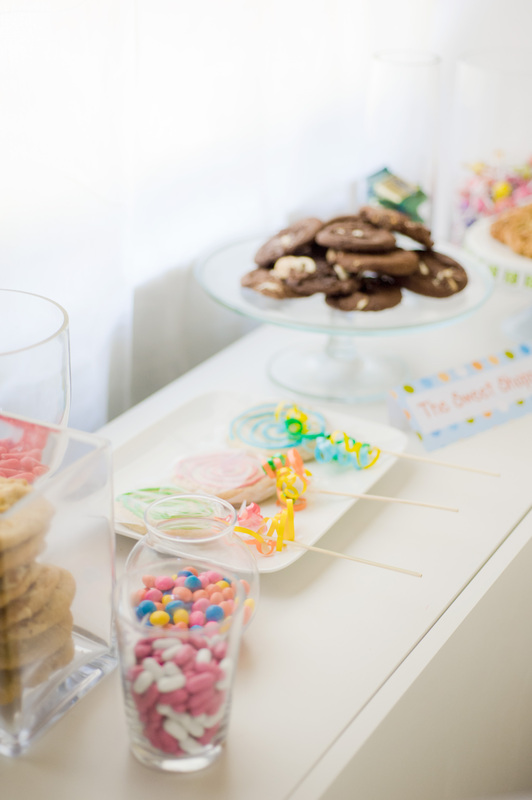 With consumable gifts, they can enjoy the treats without the clutter! 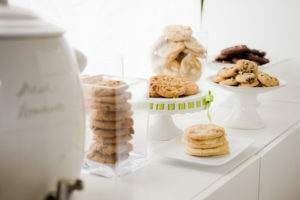 And they have some really yummy goodies that they can share with their family and friends. Give us a call today and we’ll help you say a very SWEET thank you to every teacher on your list! 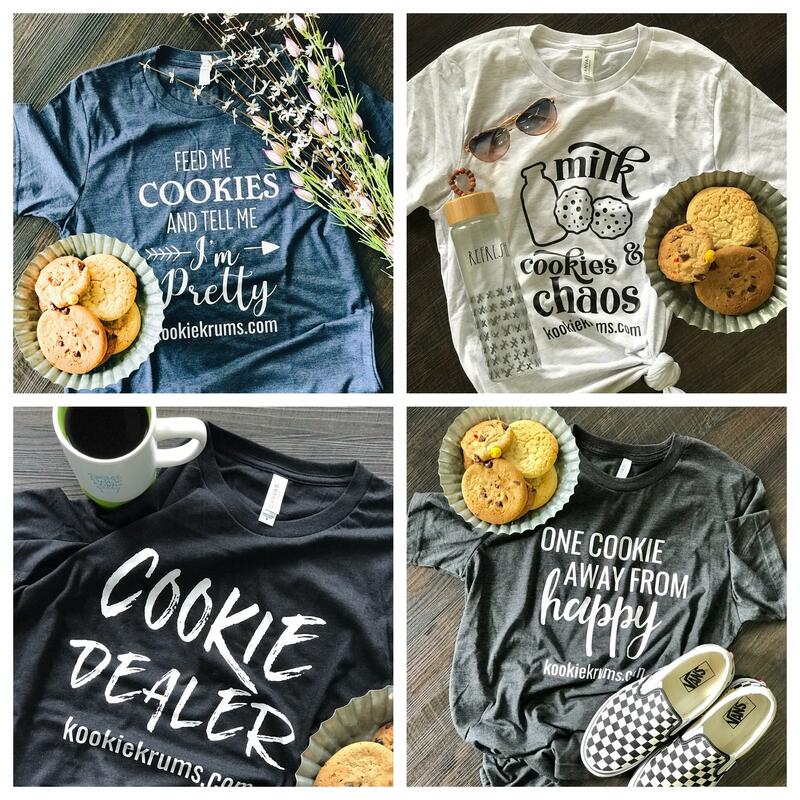 Kookie Krums is Your Corporate Holiday Gifts Headquarters! 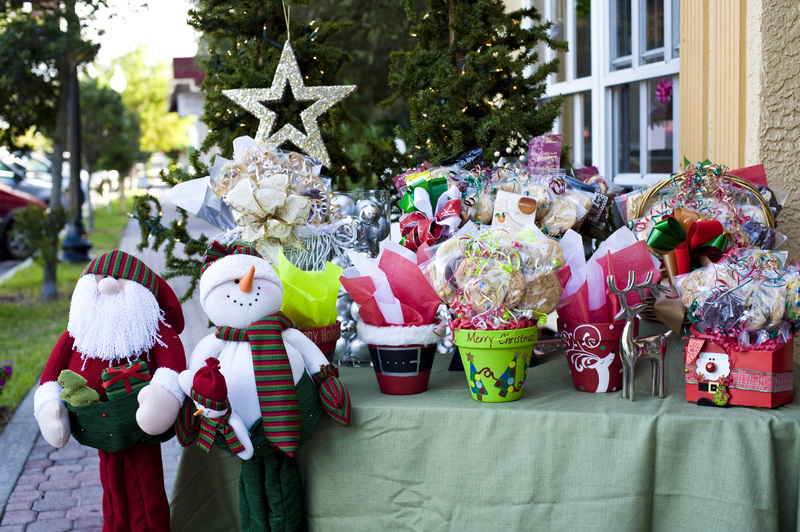 Holiday gifts have become a staple in the corporate world. With so many companies competing for the same business, customers everywhere are looking for those companies that go one step further to appreciate them. The holidays are a great time to send a special gift to those important customers that will keep you on their mind all throughout the year. If you’re looking for a gift to send for corporate business, we have some great ideas for you. 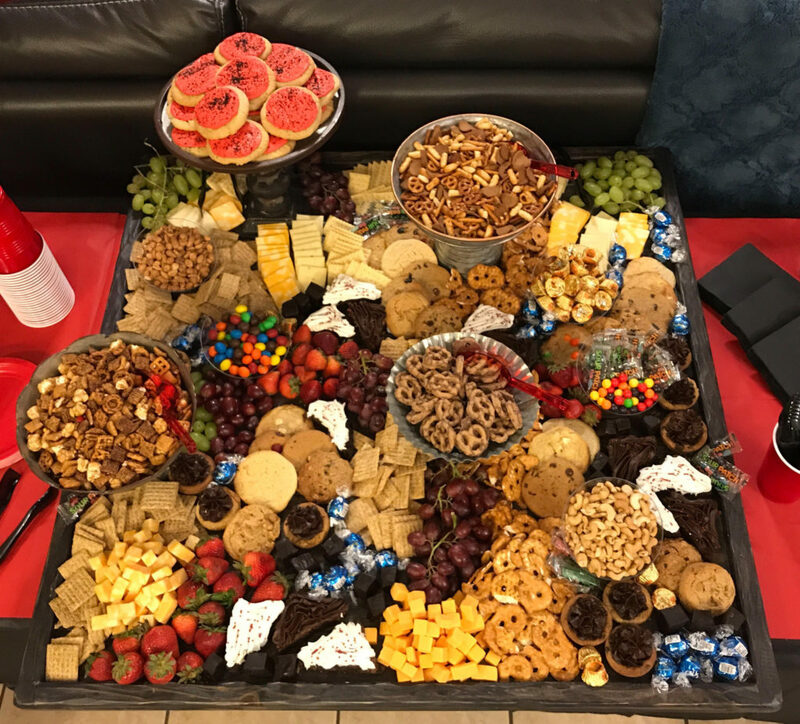 Cookie platters and dessert trays are a fantastic way to gift large offices on a very reasonable budget. There’s really no need to invest in fancy containers if you’re just looking to treat a large number of people. 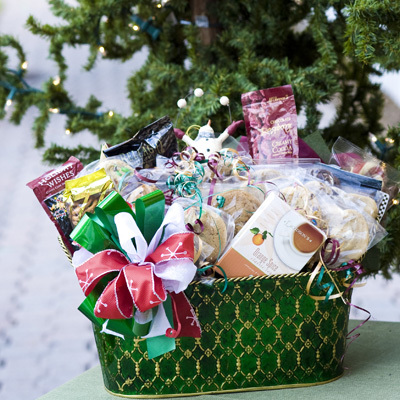 However, if you need to send a beautifully presented gift to one or two people, but would also like to have enough for them to share with the entire office, our gift baskets are both beautiful and budget friendly. 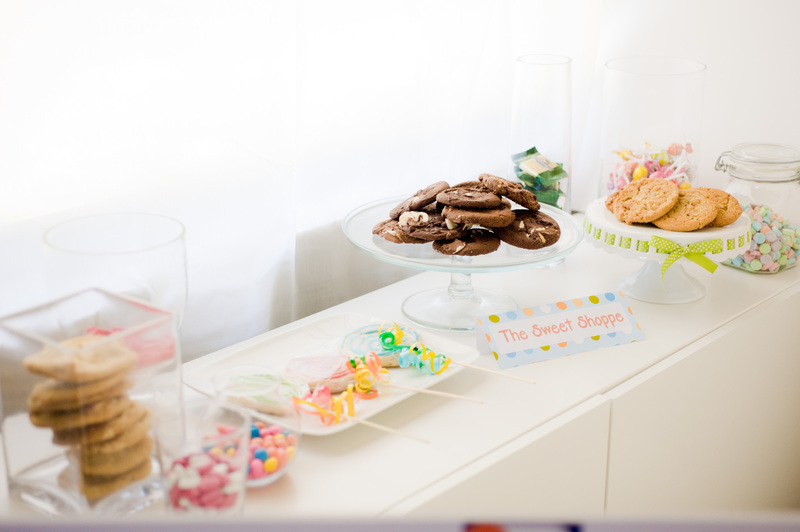 We can include all kinds of treats in our baskets, from cookies, muffins, and brownies, to chocolate covered nuts and snacks, to coffees and cocoas. The great part about it is that you can choose what you would like to have included, or you can give us a budget and we’ll create something for you! Sending individual gifts to your client list? We have that covered as well! 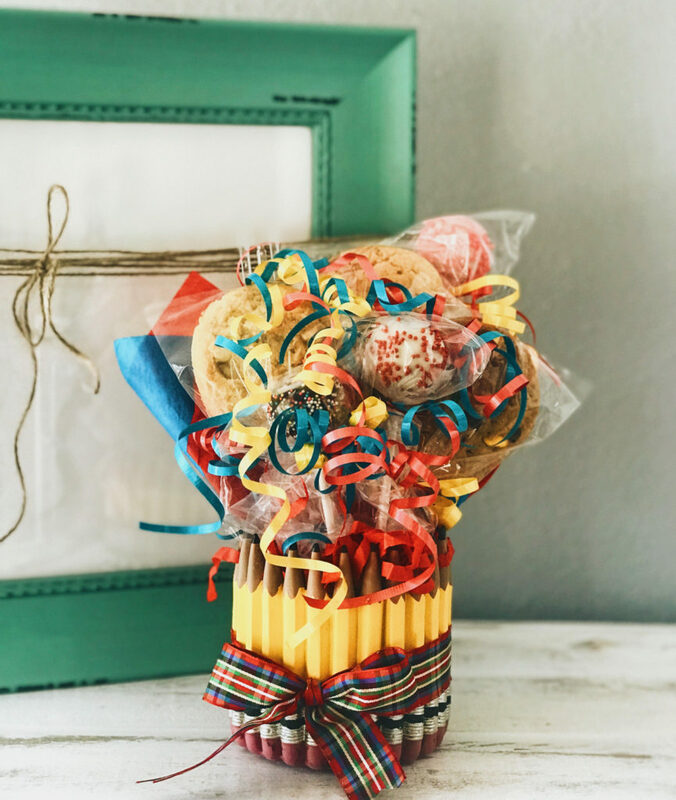 Cookie bouquets make a fabulous presentation. Cookie boxes have become extremely popular in the last several years as well! The boxes come in all different holiday designs, and are filled with cookies, wrapped in cellophane, and topped off with a festive bow. A beautiful display that will make just the statement you’re looking for. We have fun, fancy, and functional containers for all sizes of gifts and all sizes of budgets. We are great at customizing too! We do custom gift tags, stickers, letters, cards and more to make your gift one of a kind and very special for your customers. Our ideas are pretty endless, and we love the challenge of creating a gift that is perfect for the message you’re sending! Call us now, though, as you’ll want to get on our calendar as early as possible as we fill up quickly. We’re taking orders today, and we would love to include yours too! 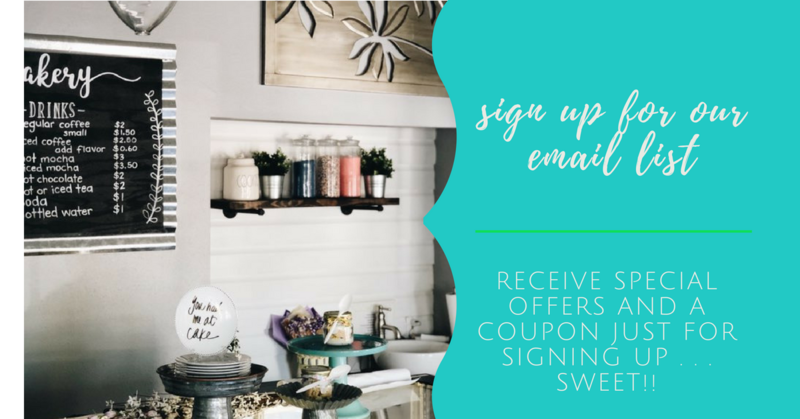 Sign up for our preferred customer list and receive special discount!